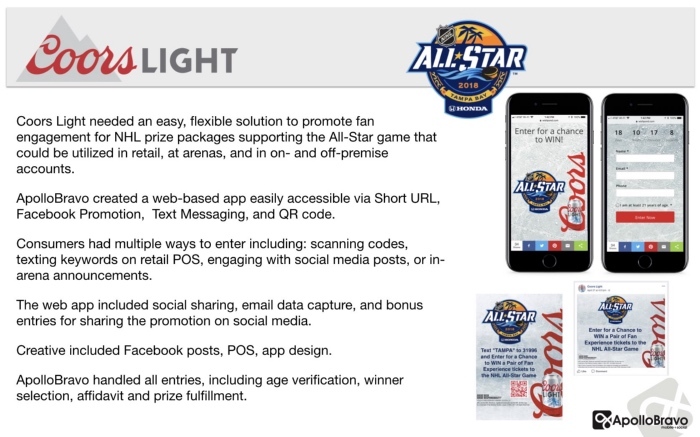 ApolloBravo developed a multi-platform digital promotion to promote Coors Light ’s sponsorship of NHL Hockey. We created a web-based app easily accessible via text messaging and QR codes. The promotion encouraged consumers to get information about promotions and enter the sweepstakes for NHL All-Star game tickets. Major retailers could incorporate a Text-2-Win sweepstakes as well as custom QR codes on POS materials. Creative included mobile-optimized landing page design, Facebook promotional posts, and Custom QR codes.